Flame spraying is a coating method widely used in manufacturing machinery components for the oilfield and pipeline industry. As depicted by its name, the process utilizes flame in its application. Here are four things you need to know about flame spraying. 1. Flame spraying is a thermal coating process. 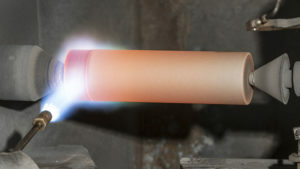 Flame spraying is a thermal spray technique that was developed during the 20th century. It is a coating process that utilizes heat with the basic principles of a welding torch. Flame spray is commonly used in metallic or ceramic coating applications onto various components that require excellent strength and corrosion-resistance. 2. Flame spraying uses oxygen and fuel gas. In flame spraying, oxygen and a fuel gas are ignited to create a flame, which provides the heat needed in the process. Acetylene, propane, and propylene are some of the fuel gases that can be used. Flame spray uses heat to melt thermal spray material which is typically in powder, wire or ceramic cord form. With a high velocity of air, the molten particles are then propelled to the substrate. A flame spray gun is used to melt and soften the coating material with heat and then eject the molten material onto the component in a directed stream. Different materials– powder, wire or cord– require different kind of guns and equipment. Aluminum, ceramic, low carbon steel and nickel-based materials are some of the commonly used materials for flame spraying. 3. Flame spraying is a popular coating technique. It is a relatively cost-effective coating technology. The process is simple in design and easy to operate. It is a versatile process that can be used in any metal or ceramic component. Flame spray coating improves a component’s hardness and wear resistance. 4. Flame spraying is widely used across different industries. Flame spray is widely used in machinery and engine parts manufacturing for industries that require corrosion protection, which includes almost every industry. It can also be used to restore and reclaim worn out shafts. Flame spray coatings are more porous, which is advantageous to applications that use lubricants. The coating can absorb these lubricants, improving the performance of the bearing. N&S Flame Spray has the ability to spray weld with multiple coatings including nickel coating, ceramic coating, copper coating, aluminum coating and many more. Contact us to know more about flame spraying!